Time for our monthly newsletter. This one coincides with Valentine’s Day. Hopefully you are ‘loving thy neighbour’ as well as your partners! 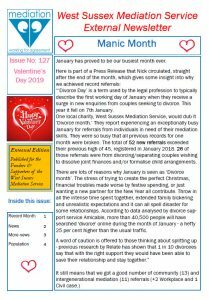 In this edition we highlight our record January and explain why we get a spike, each new year, due to divorcing/separating couples moving on in life. There are also two pages of various news items. Click here or on the image below to view. To receive our news on a regular basis, just sign up at the bottom of our news page.